I really enjoy when people either send me good photos or, even better, bring me insect specimens to identify. I am by no stretch of the imagination an expert ID-er, but I adore a good challenge and relish the opportunity to familiarize myself with a new insect. An online friend recently provided a photograph of a chubby little fellow who had hitched a ride indoors on one of her pets. She lives not-so-very-far-away from me and experiences nearly identical weather/climate. She was quite surprised to see a critter like this outdoors in January, although the day he came into her home, it was unseasonably mild (+6°C or so). The first thing my gut told me was: “Pesty”. Then, “Cutworm”. It didn’t take me long to find a match: Noctua pronuba (Lepidoptera, Noctuidae), the European Yellow Underwing (generally called the Large Yellow Underwing in its native range). I’m always rather tickled when I find moths of this ilk; I adore the bold yellow-and-black striped underwings sported by the adults. It’s a wonderfully unexpected flashy bit of bug bling that seems out of character with the otherwise brown/black colouration of the rest of the animal. (Susannah at Wanderin’ Weeta has some nice pics of the adult moth). Noctua pronuba isn’t native to Ontario; it’s indigenous to Asia and Europe where it is widespread. It was likely introduced to North America in the early to mid 80’s and is now found coast to coast in both Canada and the U.S. It is a generalist herbivore, attacking grasses, flowers and vegetables alike, and is considered by some to be among the worst garden pests. An interesting tidbit: apparently, although the moth overwinters as a larva (caterpillar), it is known to venture out to feed on milder winter days. Perhaps the January sighting of this critter was not so out of character after all! I gather that Noctua pronuba caterpillars can also be bright green, they change color to brown for the last instar before pupating. Yes, Tim, there’s actually a LOT of colour variation in this species, and indeed can be a lovely shade of green. The black markings on either side are pretty characteristic, though. I am no happy to see Noctua pronuba as my dog died of a massive infestation (hundreds) that he somehow injested. We suspect that they were harboring in his body for nearly a year and a half as respiratory symtoms slowly developed over that period of time. The vet finally wormed him at which time hundreds Noctua pronuba left his body in a bloody stools. His lungs filled with fluid and he became very anemic. I sent worm samples to a Michigan State University Entomologist who indicated there was no doubt that they were Noctua pronuba–which he suspected the dog ate very recently. Where the dog found them is a mystery to us–We live in the Upper Peninsual of Michigan and we have not seen the catterpillers nor moths in our area. There was a massive outbreak in lower Michigan in 2007 and 2008 where other animals injested Noctua pronuba and became ill, but no reported deaths. Our dog died on November 1, 2010, a couple years after that outbreak. No one in our area was even famiar with this insect. If your pet dragged Noctua pronuba into your house, it could have injested others. Be ware of allergic reactions, vomiting blood, bloody stools, and future respitory problems. Dogs, cats, and squirrels can find them “particularly tastey”. I’m sorry to hear about your dog. I don’t doubt that he may have eaten a large number of caterpillars (my dogs will eat anything), perhaps over a long period of time if he found them tasty, and that they may have caused an allergic reaction or gastrointestinal distress, especially if the caterpillars he ate had been treated with pesticides (since they are significant plant pests). That said, it would be impossible for them to live in the body of any animal for any period of time after ingestion – caterpillars are not like intestinal parasites; they are not equipped to eat or breathe in that kind of environment. Any caterpillars that came out after treatment would have been, as the specialist indicated, recently ingested. I suspect that long-term exposure to pesticides may have been the source of your dog’s illness. Again, I’m very sorry for your loss. It serves as a tragic warning to others to closely watch their pets to ensure they don’t ingest possibly dangerous items. Caton: They are in the UP also. The green one that I linked to above was one I found in our garden in the UP back in 2008. I currently live in the U.P of Michigan and have these worms in my house. I did not know of problems with pets eating them that is good to know. I am wondering though if anyone has any ideas as to why they are in my house? How do I get ride of them? It is becoming a problem as they are in my shoes daily, furniture, clothes, and any sort of small spaces. 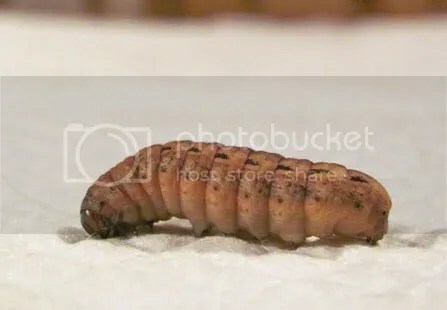 I have sent one in to my local extension office and they have identified them as the winter cutworm but have no idea why they are in my house. The only reasonable theory I have is that a moth came in this summer and laid eggs somewhere. I have plants in one area of my house but none seemed to be affected. That being said what are they eating? I am really getting to my grossed out point finding them in my bed the other night. Any help would be much appreciated. Hey there! Sorry for the late reply! I hope you found a solution for your new friend!